The tradition of the King's Cake was originally started as a method of choosing a sacred king during the time of pre-Christian religions of Europe. The cake was baked with a nut or a bean inside and whomever got the piece containing the prize was chosen as the Sacred King. 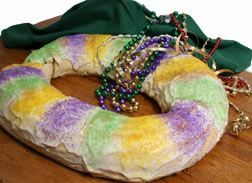 The King's Cake tradition was carried down through the generations and is still a huge part of the Carnival Season and Mardi Gras today. Today the King's Cake is centered around the Carnival Season beginning on January 6th. It is baked into a circle and is decorated with the colors of purple, green and gold to represent the three Kings. In today's tradition, a plastic baby Jesus is baked inside instead of nuts and beans. The concept behind the cake today is whoever receives the piece of cake containing the baby Jesus has to baking the next cake and hosting the next King's Cake party to keep the festivities going. The King's cake is the center of many Mardi Gras festivities where King's Cake parties are had throughout the season. Traditionally the cakes are made only during the Mardi Gras season. 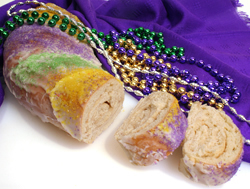 Shown below are instructions on how to make a King's Cake for your Mardi Gras celebration. Cook butter, sour cream, sugar and salt in saucepan over low heat until butter melts. Stir often. Dissolve both packets of years into 1/2 cup warm water and 1 tablespoon sugar. Let stand 5 minutes or until the yeast starts to bubble. Add the butter mixture, eggs, and 2 cups of flour; beat with a mixer for two minutes or until it becomes smooth. Gradually add enough of the remaining flour to form a soft dough. Place dough on a lightly floured surface and knead until smooth. This will take approximately 10 minutes. Place dough in a greased bowl. Turn the dough so that the grease covers all sides of it. Cover and let rest in a warm place for approximately one hour or until it doubles in size. Stir 1/2 cup of sugar and cinnamon and set aside for later. After the dough has risen, punch it down and divide it in half. Place one portion on a lightly floured surface and roll it with a rolling pin into a rectangle approximately 10x22. Spread half of the butter over the surface of the dough with a spatula; then sprinkle half of the cinnamon and sugar mixture over it. Start on the long side of the dough and roll it like a jelly roll. Place the roll seam side down on a greased baking sheet and bring the ends together to form an oval ring. Pinch ends together to seal. Cover and let rise for 20 minutes or until it doubles in size again. Bake at 375º for 15-20 minutes or until golden brown. When cake is cool, decorate with powdered sugar frosting and sprinkle with bands of colored sugars in purple, yellow and green. 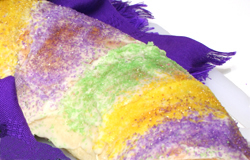 After decorating with the colored sugar your King's Cake is ready for your Mardi Gras celebration.